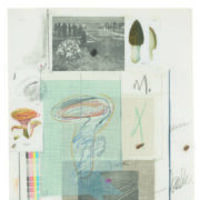 Join Gund Gallery Associate Annika Ostrom ‘20 in a discussion of Cy Twombly’s "Natural History, Part I, Mushrooms" (1974) print series, recently gifted by Graham ’63 and Ann Gund and on view. Join us to learn more from Kenyon professors, staff and students. Distinguished faculty members and administrators from across campus candidly discuss the central themes and ideas in Gund Gallery exhibitions from different disciplinary perspectives. Our Gund Associates (museum interns) regularly present their current research and curatorial projects. Image: Cy Twombly (American, 1928-2011) "No. XII, (from Natural History, Part I, Mushrooms)," 1974. Lithograph and mixed media on paper. 29 3/4 x 22 inches. Gund Gallery Collection; Purchased with funds provided by Mr. and Mrs. Graham Gund ’63.